They're the toddler books no parent can bear to part with and now everyone can take their obsession even further. Big W have released an adorable range of baby gear including baby sleep bags, onesies, pyjamas and bibs, all adorned with a selection of 'That's not my...' book covers. Co-ordinating with your no doubt extensive range of 'That's not my...' books, you can now extend the tactile and literary journey even further when it's time for your little one to go to bed. The sleep bags come in puppy and fairy designs in sizes 000 to 00, 0 to 1 and also 2, for $25 each. 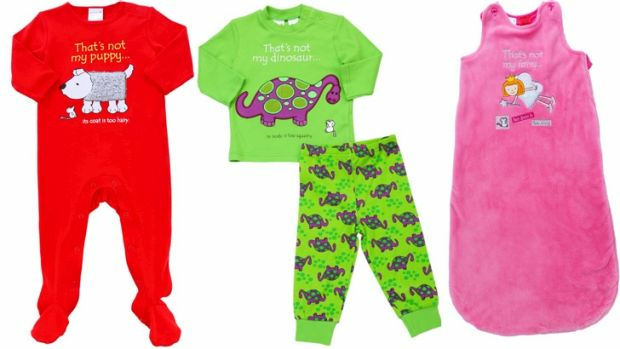 Pyjamas come in dinosaur and unicorn sets for $20. Just in time for the cooler weather are four incredibly cute designs of coveralls that have enclosed feet. Get them in puppy, fairy, monkey and kitten motifs for $20 a piece. Lastly are the adorable bibs, which come in kitten and monkey designs for just $8 each. All from Big W so run, don't walk!